[Wenman] urges more cultural artifacts, particularly of a historical nature, to be made accessible to the greatest number of people possible. Crowdfunding has enormous potential to expand entrepreneurial opportunity and reduce business risks. Cosmo Wenman, a California-based 3D printing artist and entrepreneur, has just published the first ever printable 3D surveys of the two works. In the 10 days since being published online, the designs have been downloaded close to 14,000 times. [Wenman] veut apporter un peu de « disruption » dans les musées. Faire prendre conscience aux musées qu’ils pourraient scanner par eux-mêmes leurs oeuvres et qu’ils devraient les distribuer gratuitement. One of the side effects of [Wenman’s] project is to throw some light on the fundamental arbitrariness of copyright terms. This Kickstarter project plans to replicate artefacts and create an open source database of artwork from the world’s museums. Access for all! Cosmo Wenman is one of the men on the cutting edge of doing supercool things with 3D tech, and he’s focusing on its art and archeological history implications, via a very interesting Kickstarter project that he calls Through a Scanner, Skulpturhalle. In the 19th and well into the 20th century, the museums of the world, as well as the homes of collectors, were filled with … plaster casts made from the bronze or marble originals of the more notable examples of Greek and Roman sculpture… So there’s a certain coherence in Cosmo Wenman’s current mission, which is to use 3D printing to make these classics even more broadly available than before… Hopefully his Kickstarter project will catch fire and get funded, as a significant first step in freeing the world’s sculptural riches from vaults, museums and the private collections of the lucky few and making them broadly available. When artists get a new toy, there’s no telling what they’ll do. Consumer photography had only been around 30 years before Man Ray started creating his surreal masterpieces. The way California artist Cosmo Wenman uses the 3D printer has the same potential to change the world of art. This Kickstarter campaign got me thinking that we are about to experience a new and improved 21st-century version of cast collections and open access to art. The Skulpturhalle Basel museum in Basel, Switzerland will host a revolutionary 3D scanning and 3D printing project, under the title, Through a Scanner, Skulpturhalle, introduced by Cosmo Wenman, a 3D printing pioneer based in Southern California. Cosmo has just launched a Kickstarter to get him to the Skulpturhalle Basel museum in Switzerland, where he plans to scan 20 archetypal plaster sculptures and replicate at least one of them in life-size for a future 3D Printshow. The best part is that Cosmo plans to release these scans as copyright-free files on Thingiverse. It’s a cause worth supporting. Cosmo Wenman is a man with a dream. His dream is to allow anyone who has ever wanted a sculpture that can only be found in a museum or a gallery the chance to have one. Wenman’s idea has great potential for schools — from kindergarten to the university level, especially if it catches on elsewhere. Art history classes might not have to study Rodin’s or Michelangelo’s sculptures only from a picture in a book. And 3D printing could be applied in other areas, such as historical artifacts or models of ancient cities. The Skulpturhalle Basel museum in Basel, Switzerland houses approximately 2,000 plaster casts of ancient Greek and Roman sculptures. Thanks to the work of a Southern California-based 3D printing artist named Cosmo Wenman, you may soon be able to download the plans and print them yourself. By making the scans available to anyone, Wenman hopes to further the goal of digitizing the world’s cultural heritage. As a demonstration for what he hopes to accomplish with his project Through A Scanner, Skulpturhalle, artist Cosmo Wenman has started making good on his promise to scan, cleanup, and share notable masterworks of art and sculpture with world early — his crowdfunding project is just getting started, and he is already sharing artwork for free on Thingiverse! Wenman’s plan is to make all of his 3D files publicly available in the MakerBot Thingiverse, where anyone could freely recreate sculptures that are currently accessible only in art museums. There’s a great article in The Atlantic Cities this weekend that is likely giving heartburn to museums around the world. 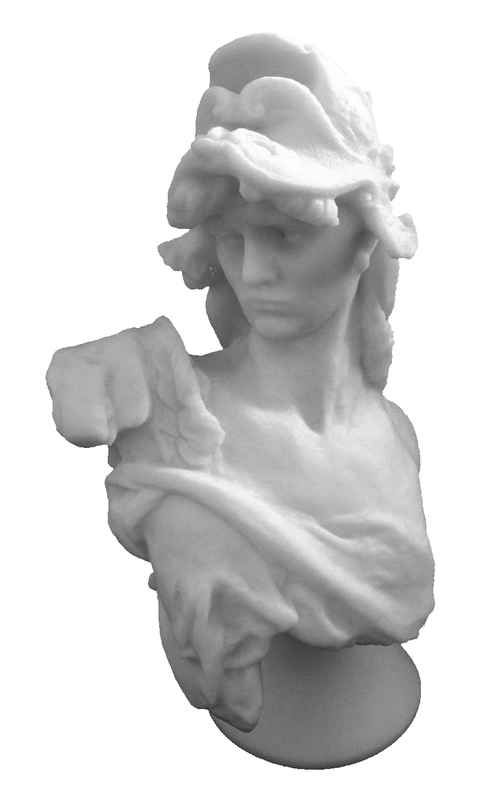 Cosmo Wenman wants to capture dozens of masterpieces in 3D so that anybody can freely print them at home. We are looking forward to see his print … and we can’t wait to own our very own 3D printed Venus de Milo. All of this raises new and old questions about the relationship between the artist and the museum, and about art as intellectual property. His sculptures are 3D-printed replicas of ancient works of art, capturing the look and feel of those works of old but reproduced in a way that could only be done with the advancements (and limitations) of modern technology. Here’s how he does it. … extraordinary achievements, which have really pushed the limits on 3D printing using low-cost, home-model printers. Cosmo Wenman has been consistently blowing the tops off of preconceived notions concerning what is technically possible for DIY 3D scanning and printing, as well as bringing up big important questions about what these tools can and should be used for. The masterworks of three-dimensional art are joining the digital commons. For art lovers, this technological moment represents a tremendous opportunity. Some people are just designed to push the limits of things. They see possibilities where others see limitations. And then there’s the special breed of person who finds all these new answers and then shares them with everyone else. Cosmo Wenman continues to prove himself one such person. Maybe these requests themselves are an art project, or maybe Cosmo’s trying to make a point about the responsibility we each bear to digitize the world. Or maybe he’s just trying to tell the rest of us to use photos and other resources that are available to turn these things and everything else into 3D models.